Submit Your Architecture Projects to the Holcim Awards – $2 Million in Prize Money Awarded! THE HOLCIM AWARDS IS NOW ACCEPTING ENTRIES! Since accepting its first application back in 2005, the Holcim Awards has recognized more that 150 innovative architecture projects from across the globe that have advanced sustainability in the built environment. Now in it’s eighth year, the Holcim Awards has become one of the most important international design competitions, highlighting exceptional work from designers around the world that want to contribute to a greener, more resilient built environment. As in years past, the 2014 competition is looking for bold ideas from both industry professionals and “next generation” designers (i.e. young professionals and students) that contribute to sustainability within architecture, building, civil engineering, landscape and urban design, as well as construction materials and technologies. The Holicm foundation will be awarding a cool $2 million in prize money (WOW!) to the most exceptional projects evaluated under the five “target issues” for sustainable construction at both a regional and global level. 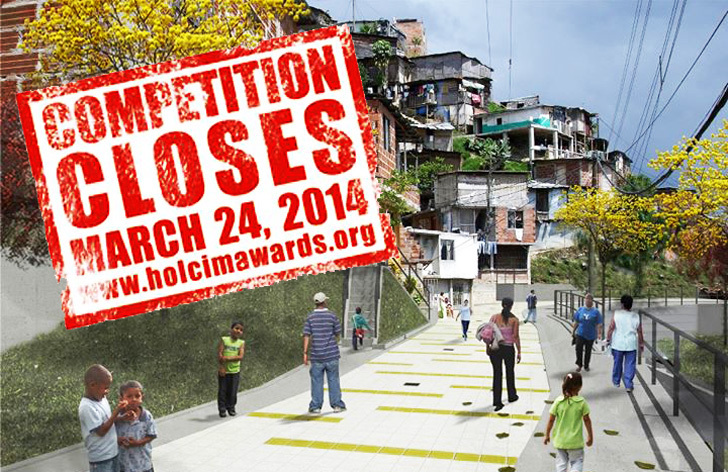 Entries must be submitted online at www.holcimawards.org by March 24, 2014.